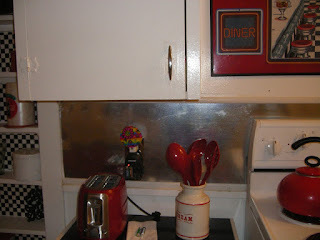 can have a stainless steel looking backsplash for under $40. 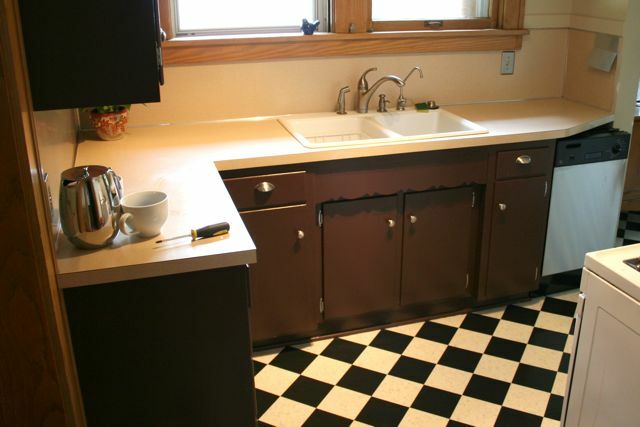 For us we just couldn't spend more on the backsplash than we did the countertop. Stainless steel tiles were too expensive and sheet stainless steel required someone to fabricate it. By using aluminum roof flashing you can fabricate the metal yourself and save on labor costs and materials. 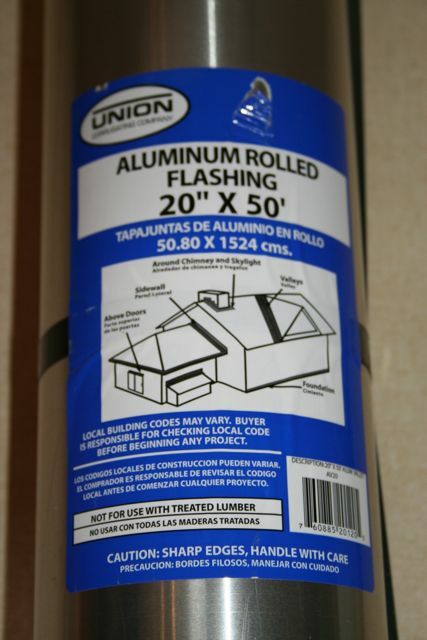 The aluminum flashing comes in long rolls in lots of different widths. Amazingly the brand at lowes has a similar #4 brushed finish that most stainless steel appliances have so it is a really good match. To cut each piece to length I just used a ruler clamped down over the flashing. 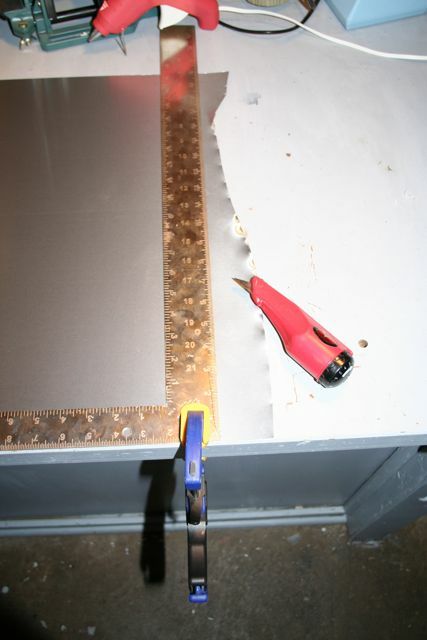 Then used a box cutter to score the metal along the rulers edge. You won't need to cut the aluminum all the way though. It will easily snap apart by just bending it back and forth a little. I first attempted cutting the metal with a hand shear but it proved to be too labor intensive and the edges were not as clean cut as with the box cutter. Because the flashing is so thin you will need some type of flat backing board so imperfections won't show through the metal. I used the existing laminate backsplash and glued the flashing with a construction adhesive. In hind sight it may be better to use a lighter weight or spray on adhesive because in some areas you can see the glue underneath. I tucked the aluminum flashing under the old backsplash metal molding. For the countertop moulding I used 1/2" aluminum angle. Here is the kitchen before. You can compare the stainless steel dishwasher to the backsplash and see they match very closely. A special thank you to Lisa who was very brave and followed this post. 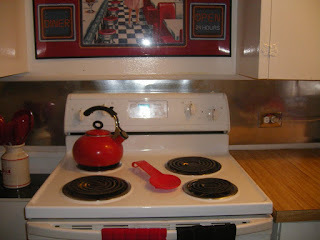 Below are some photos of her finished backsplash. Excellent job Lisa it looks great! I loved to see and hear it worked out for you. WoW! This looks great! What a value and the look is great! Thank you so much for this idea! After reviewing your detailed instructions, we decided to try it. 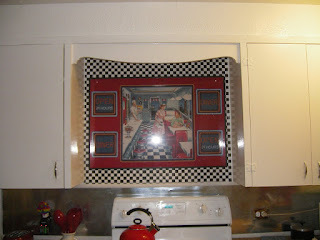 For $50 we now have a spectacular new backsplash that has received many compliments. Thanks so much! It's great to hear it went well for you. My backsplash is still looking brand new. Thank you! Great idea, did it also, looks great. Two words of advice for anyone doing this, One, basic household scissors cuts this material the best and two, the self adhesive works great but you better have your piece cut correctly and lined up straight because adjusting on the wall is tough. 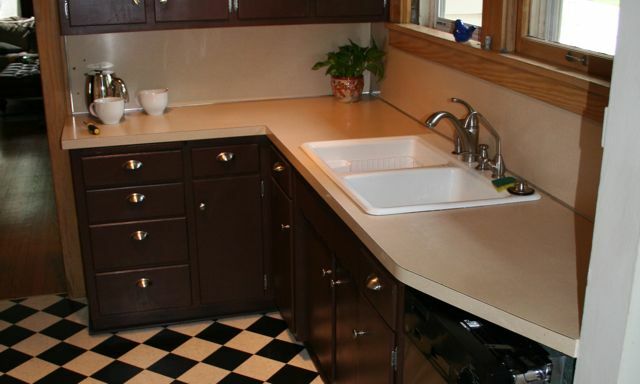 Your backsplash looks great! I'm wondering how it's standing up. 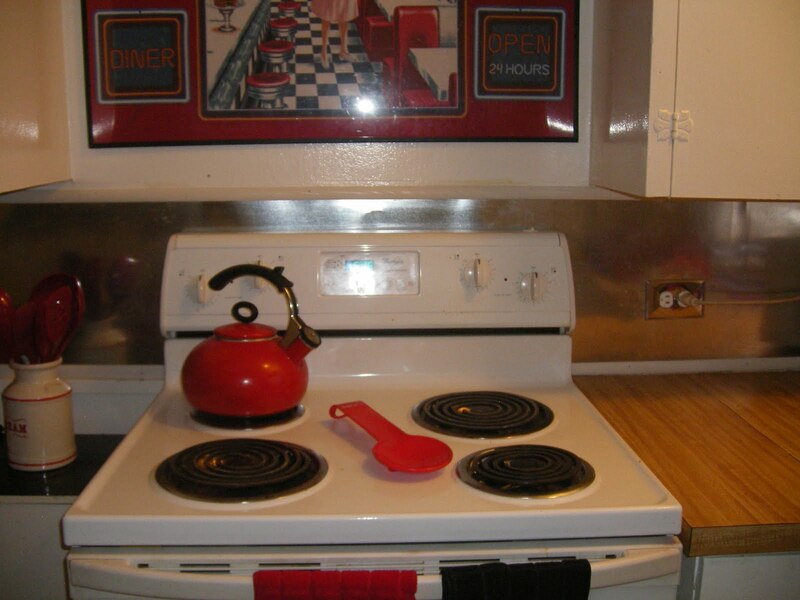 I know of someone who has a very expensive stainless backsplash but doesn't like it because it stains very easily. How is the aluminum to live with? I cheated a bit and hooked the top of the aluminum into the old edging. I used a little glue at the bottom behind the counter top. If I did it again I would roll a thin layer of glue on a backer board so it was glued everywhere. The outside wall bubbles out a little in winter when it's cold. It's not very noticeable in my cause but it could be an issue. 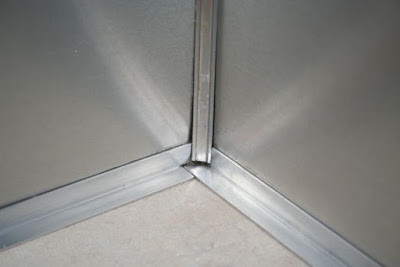 The aluminum is very easy to clean as opposed to stainless steel. It looks like the day I installed it. I wouldn't take a scrubbing pad to it though as it might scratch it. Let me know if you have more questions. 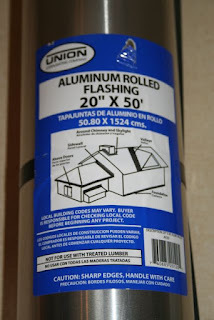 I have used aluminum flashing in several other projects, and saved a ton of money! In my garage I built cabinets, painted them black then used the aluminum on the door fronts. It looks awesome! 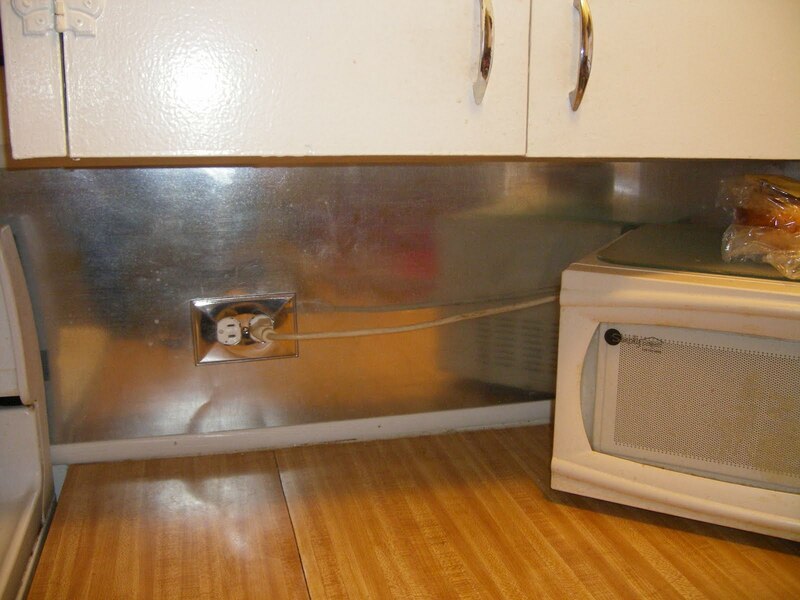 I can't even cut out the area for the outlets. Is there a difference in thickness you can buy at Lowes? I'm using a new razor in my boxcutter and it just won't cut through! I believe I drilled a hole and used a tin snipers for the outlets. Be careful because tin snipers don't leave a very clean edge but it will most likely be hidden behind the wall plate. Best of luck on finishing it. I'd love to post some pictures when you are done if interested. Thank you! I have textured walls. What kind of glue should I use? Depending on the gauge of the aluminum you may have to put it on a backer board first and then put it on your wall so the texture won't show through. The metal I used was very thin and would show the construction adhesive through the front if the glue wasn't rolled flat first. If I did it over I might try using double stick flooring tape that's used for vinyl floors. You might have to do a test piece and see what works best for you. I'm still really happy with my backsplash and it looks like it did the day I installed it. Thanks for adding my pics! I forgot all about it til now! I do love the way it looks but it seems to have turned out much better in the other pics I've seen online...maybe judging myself too harshly...? I think my flashing was thicker and harder to cut but I've had a lot of compliments, so I guess all the frustration was worth it. lol Now I have to figure out what to do with the counter tops. Would this work for countertops? 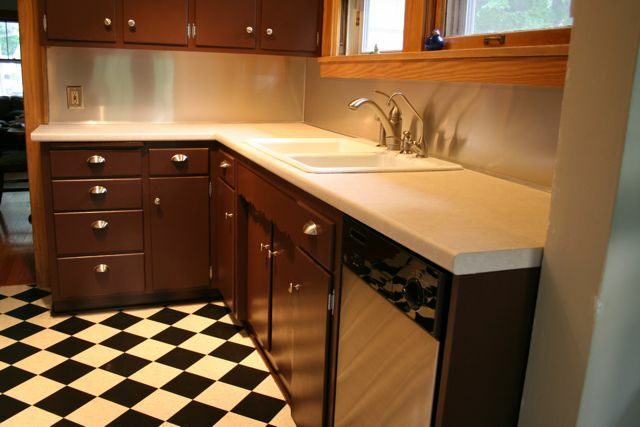 I am looking into stainless steel countertops and wonder if aluminum would work for that instead. 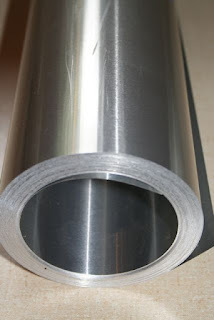 Hi, would you know if thi material could be used behind a stove ? It would'nt go behind it entirely. How easy is it to clean ? It's very easy to clean. Should be fine behind a standard stove oven. You could test it outside with a blow torch just to see what happens. Some of the aluminum has a coating i believe. I'm so glad to find pictures, it looks simply great! This finish is one I'm planning to use soon. On the outlet issue, what's the best way to figure out where to mark the outlet opening on the flashing. I drilled a hole where the outlet cut would be. Then used tin snips to cut it square. It was the hardest part. Lots of sharp edges. Make sure you turn the electric off while you are working. 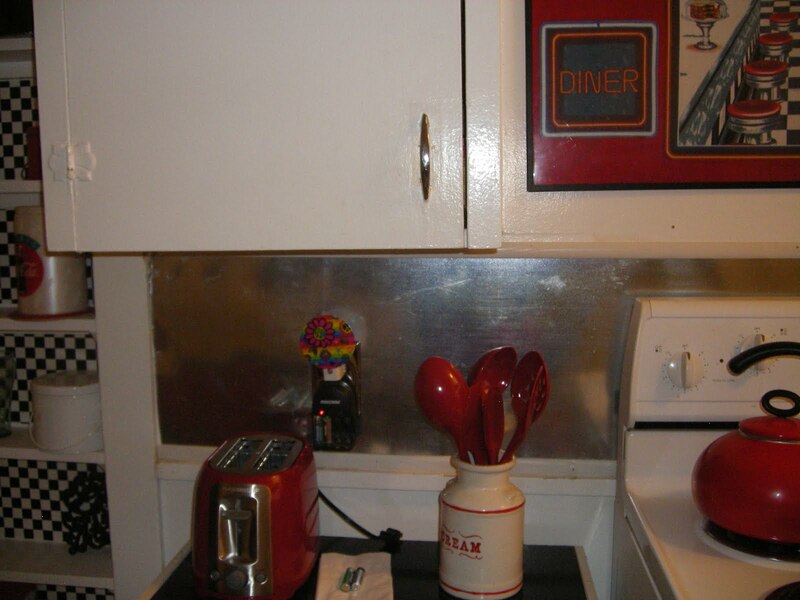 Our old FORMICA backsplash is coming away from the wall---the glue behind it is giving way (it was installed in 1963--old house. I was thinking of pulling that old stuff OFF first, and THEN gluing up the new flashing. 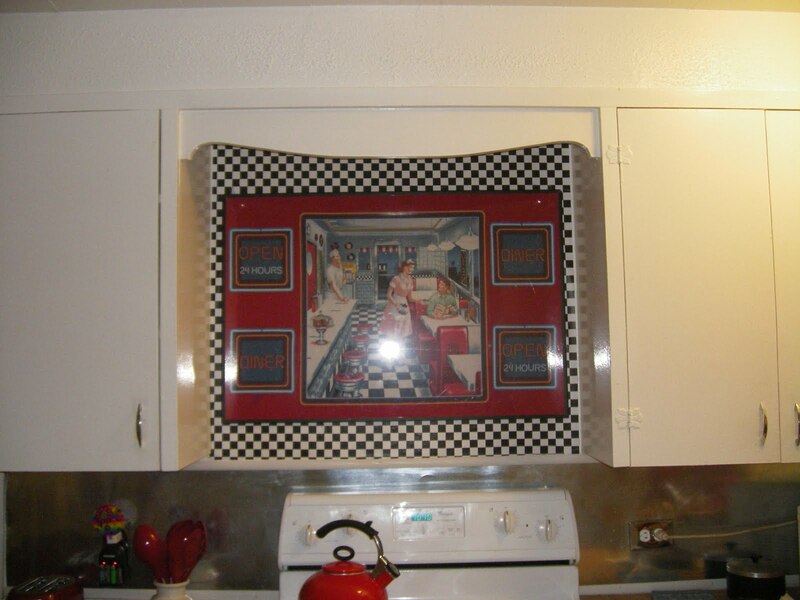 So my question is--when you say attach the flashing to the "backboard"--do you mean the EXISTING backsplash? I'm worried because you said irregularities (and even the glue) made visible indentations on the front of the flashing, and if that's so then I'm not sure it'll work for me, since the plywood wall in back is sure to be "uneven" once I tear off the formica--the old glue might still partially be there and I'm not sure I can get it all off. So what do you mean by the "backboard" and what are your suggestions for my situation?